If you’re looking for the ultimate in luxurious luggage, look no further than this gorgeous black Porsche Roadster suitcase (CHECK PRICE NOW!). 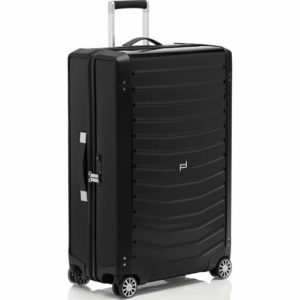 This suitcase is for the refined traveller, who doesn’t compromise on quality. Whether you’re a Porsche driver or not, you deserve top quality, luxury products. I knew from the moment I felt this case in my hands, it would not disappoint me. I love how it has the same boxy but sleek features as the car it was named after, The Roadster. The suitcase itself felt powerful, with incredibly high quality materials, and attention to detail. This is the extra large size, with a capacity of between 95-100 litres, this case will really see you through for a long trip. Even for obsessive over packers like myself. It can hold everything you need for a good 3-4 week trip, with plenty of room for shopping and souvenirs. The four rubber spinning wheels are faultless, they glide so smoothly without a bump. They’re 360 degree spinning so you can really whiz through the airport, and they held up on all terrains, from the gravel of my front drive, to the carpark tarmac, and mediterranean cobbles, these wheels didn’t give me a single problem. They feel super sturdy and strong enough to hold even the heaviest of packers, in fact my 4 year old daughter sat on the case as I wheeled it along in the airport and the wheels showed no sign of faltering. Every detail on this case is just perfect. The zippers are really sleek and strong, and they can be locked into the built-in TSA approved lock. So you can travel in peace, knowing your luggage is secure as can be. The handle is telescopic and adjustable for ultimate comfort when you travel, and the handle is a super comfy ergonomic gel rubber material, it almost moulds to your hand. The inner is beautifully lined with a shiny soft material, and the interior separates into two compartments, which not only provide you with ease of organisation, but this suitcase is so huge that it could easily be shared between two people, with one side each. This is quite a heavy suitcase. Weighing in at 6.25 kilograms it is definitely at the heavier end of the scale, but it is so heavy duty and durable, I honestly feel that this suitcase could withstand the impact of a car-crash or an explosion or anything else high impact like that. The hard shell material used is polycarbonate, which is super strong and durable even in harsh conditions. So you can be assured your luggage is going to arrive without a scratch and entirely in one piece. 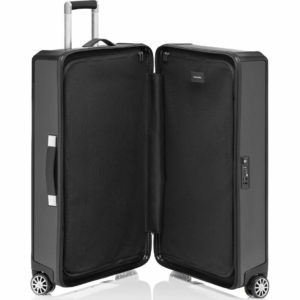 Ultimately what attracts me most to this incredible suitcase is the impeccable design. I just can’t fault it. From the hard black shell, to the horizontal line design, its just streamline and smart. It also comes in two other gorgeous colours, as well as the black, there is dark blue and grey. All three timelessly classic colours. Designed by Porsche, of course the craftsmanship is going to be perfected to the final detail. With no room for compromise, this suitcase is just the ultimate in luxury. To round things up, I would say that if you’re looking for impeccable craftsmanship, that combines a perfectionist design with brilliant practicality, then look no further than this gorgeous case. For me the main attraction has got to be the design, designed by Porsche themselves, there’s really nothing they’ve not though of in making this a truly fantastic looking case. Not only does it look incredible but functions perfectly. They’ve thought of everything here which is why I didn’t feel guilty paying high end for a suitcase. I initially was apprehensive, but once I saw and got the case myself I know it was going to be worth every penny. Its incredibly hard to judge the quality of something based on a picture, but I assure you, you won’t regret this purchase. If you’re thinking about it I say go for it! If you’ve got the cash to splash, then this suitcase is for you. If not, there are millions of other suitcases that ultimately do the same job as this case, but its not quite Porsche! I do not regret my purchase and would definitely recommend it to anyone else!